Spirited violinist Katherine “Kat” Peter performs and teaches violin across Ontario. 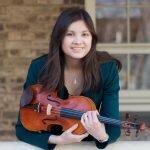 She is an active member of the Brott Music Festival Orchestra, York Region Chamber Music collective, and University of Toronto Student Composer concert series. In the past she has won multiple gold medals in the Kiwanis Festival for both violin and piano, and performed through the Young Artists Performance Program at the RCM with distinction and scholarship. She frequently performs in Markham with the Kindred Spirits Orchestra. Kat has a Bachelor’s of Music and a Master’s of Music in Performance Violin. She has studied under professional Canadian musicians including Dianne Werner, Marie Bérard, Thomas Williams and Annalee Patipatanakoon. Kat plays a 1949 Pierre Audinot violin from Paris, France.